If you’re teaching a split class (multi-grade or combined class) and need advice on classroom management and organization, you’ve come to the right place! You’ll find practical tips from teachers who have taught in multi-level classrooms and combined classes at all different grade levels. I’ve invited teacher-blogger Mary Mueller of Guided-Math to share more about her experience with teaching split classrooms. Thank you, Mary, for the helping tips! Did you just find out you are teaching a split/combination/multi-age classroom? Are you in a bit of a panic mode trying to figure out how on earth you are going to handle two (sometimes more) grade levels at once? Ten years ago, my teaching career began in a split classroom in a very large school district in Illinois. First of all, I can’t believe that I just wrote ten years! Secondly, now that I am counting, I can’t believe that seven of those years have been in combination classrooms! All of those questions and panic moments went through my head with the news of my first assignment. Back then, I never knew that first year, in a 1/2 split, would set me on a path of more split classrooms and would help positively shape who I am as a teacher today. In the beginning, I saw combination teaching as a welcome challenge. This was a challenge that I was not going fail at. I was always looking at what I did and figuring out how I could make the structure better for both my students and I. Throughout my years in 1/2, 2/3, 3/4 splits and three years in 4th grade, I realized that split teaching is really no different than a straight classroom. I found that I did not change how I taught or how I structured my day in a split classroom than I did for my straight grade. Here are some things to think about when planning your combination classroom. Talk to your administrator to find out what is required of you.Do you have to teach two separate curriculums? What subjects can you combine? How can your teammates support you? Think of your class as a range of abilities rather than two different grade levels.The reality is a straight grade can have just a big of an ability spread as a combination classroom. I recommend a balanced literacy format.Teach reading and writing lessons as a whole group, and then break up into small groups for guided reading or individual conferences. This is where you will meet the needs of your students. Typically you will have to teach two separate math curriculums.I highly suggest you look at the Guided Math format. This will solve how to teach two math curriculums and gives you a chance to individualize math instruction. Be prepared before the school year begins with information for parents.When those class lists go up, you are bound to have questions from parents. Being prepared to show them how you are going to effectively handle two grades will ease their fears. Create a brochure or newsletter with your teaching schedule, what curriculum you are going to cover, and details how you are going to meet the needs of your students. Stay positive! !Get in the mindset that this is going to be a great experience, not just for the students but you as well! Good luck with your combination classroom teaching assignment! I know that you can and will succeed! For more information and to read more about how I structure my math or multi-age classroom check out my website, Guided-Math . The following questions were submitted to me as part of the Ask Angela Anything blog post series. You can submit any teaching-related question anonymously to maintain your privacy and student confidentiality. I’m including the two questions below here on this page instead of in the column to make it easier for teachers of combined classes to find answers all in one place. I am teaching a 2nd/3rd grade split. I’ve heard to call one level the juniors and the other level the seniors. My gut tells me not to start day one saying my 2nds or my 3rds but is it inevitable? What’s the best way to manage the classroom to create a team yet honor their grade levels? I don’t want any of my third graders to feel like they are still in second. Hi, Jane! There will be times when you need to refer to them by grade levels, and at those times, personally, I would call them second graders and third graders. But you can also let each grade level choose a name for themselves that reflects their unique identity as a class within a class. It can be part of your first week of school activities, kind of like some teachers do with reading groups. I think that would be a nice way to build a sense of community and give kids ownership over the classroom. They could also create a class name so they have one cohesive identity, too. For example, your whole class could be the whales, and your second graders could be the orcas and the third graders could be the belugas. Tell the kids about your dilemma on what to call them, and ask for their input! I bet they’ll come up with something way better than either of us could think of. I have applied for a job in a combined 4/5 classroom and I have a good chance that I will get an interview. I don’t have any experience in multi-level rooms, I don’t even know what kinds of questions to ask, and, although I can see how the Cornerstone book could be a help with this type of classroom, is there anything that your book does not mention to help me organize for this type of room? I would imagine that the 4th and 5th graders would work together on many assignments; you’d be able to differentiate your instruction and activities by ability level and not just grade level. This would probably be the way the principal would like it, judging by what I see in recent educational trends. If you would teach that way, then it would probably be helpful–in preparation for the interview–to come up with a few specific examples of how you would do this. In terms of organizing, you may need to keep some things separate (maybe different bins for them to turn in their papers, etc.) but for the most part I don’t think the grade level split would change much about the room layout. Angela is a National Board Certified Teacher with 8 years experience as a K-12 instructional coach and 11 years experience in the classroom. As founder of Due Season Press and Educational Services, she has created printable curriculum resources , online courses , 4 books , the Truth for Teachers podcast , and the 40 Hour Teacher Workweek Club . She’s been supporting teachers through this website since 2003. I just got hired in a K-3 classroom and this is my first year as well! Do you have any tips for starting out? Sybil, I am the exact same situation. What did you do? Where did you go to get the information you needed to do the job well? Same here! I’d love to hear how you all did it! Hi! I am getting ready to interview for a K/1 classroom. Just wondering if you had any helpful suggestions or any interview tips? Hi! I am going into my 9th year in a multigrade classroom (2nd and 3rd this year) and i love it! I was just wondering how you write your lesson plans. Any tips or visual references would be much appreciated! I have a question. Is it worth to retain a student from grade level when the yearly classes are multi-grade level? Thank You. Hi, I have a question I just went on an interview to teach a multi grade class and was called back to do a demo lesson. What do you think is an appropriate lesson to do for a 2-3 class? It is the second week of school so I don’t want to make it too elaborate. Hi, I am curious about how your demo lesson went? What did you present to the team? This article is very informative, but I do have a question. How can I teach a combined class with two distinctly different age groups? Well, I’m a chess instructor for a small organisation within a school and I have regularly have new student joining, so they need to start from the very beginning of the curriculum. One of my groups has students from Grade 3-6, and the other from 16-18. I cannot move dates around and set classes for each group, so I’m left with two groups of students who think, act and interpret information differently. I do not have any other assistance at the moment, even though I am looking. Is there anything that I can do to create a better learning environment and effectively teach both groups? I’d imagine this would need to work a bit like the old one-room school houses: have the older students teach the younger students sometimes (there’s no better way to solidify your understanding of something than to teach it to someone else), and have the younger students do independent work while you teach the older students, then switch, so that each group has the opportunity to learn directly from you and then practice independently/with a partner. This is my first teaching and I have 3 grade bands grades 4-9 as an intervention specialist. Do you have any suggestions on how to meet all the standards and individual goals? Hi, I am now in a K-9 classroom. Yes a one room school. I have an assistant to help with the K-2’s. I am pulling my hair out. I dream of a two grade split. How do I survive this? Our school is going to have 3 multi-grade classes next year. (1-2, 3-4 & 5-6) Our biggest question is which students should be in these classes. Suggestions are-high first grade and low second grade (I think this is the worst choice! ), high first and high second, and forget high-low and choose students that can work independently and follow directions. I would suggest independent workers. If you choose high/low, you’re going to be pulling your hair out trying to address the needs of widely disparate abilities. With independent workers, it is easier to work with groups, while the others are working on individual or partner/group work. Hi, Our community is starting a school and I think I will need to combine a few of the grades to maximize the space and resources. From your professional experience, what grades would you say go best together? 3/4 or 4/5 or 5/6? Would it be too much too have 3/4, 5/6, and 7/8? 3/4, 5/6, and 7/8 sound like workable combinations. Many schools do it that way. I’m teaching 2/3 class next year. Do you suggest sething up the desks by grade levels or mixing the classes up? Also, do you have any ideas for math and reading centers and how to organize them? We are a small private school that has only one 3rd grade student enrolled for this coming school year. We are trying to keep the family, but we are unsure as to how to handle the situation. Multi-age with either 2nd or 4th would make sense if there was more than one student. Any thoughts on how to accommodate this student? I have to teach Grade 4/5, 6/7 and 7/8 Health. All the grades have different but similar topics; should I combine both topics? Should I teach the younger grades the older grade’s topics? I was just hired to teach EBD at a new school (this is my third year of teaching, but first year teaching science). One of my classes is 7/8 science. The pacing guides have the students starting off on two completely different topics. Do you have any suggestions as to how I can effectively teach both groups of students two different unit topics in the same class period? Thanks! I am to teach a grade 3, 4, 5 split this year with some 3s learning to read or their sounds. 9 children have individual programs and there are 25 in the class. I’m looking for advice on planning and how to balance and meet various needs with such a large curriculum to cover. I am about to start my first year of teaching and just received a job as a 4/5 teacher. I was wondering if anyone had any advice. Hi Angela, I’m currently teaching a 3/4 split that requires two different curriculums. Would be available to discuss this over skype? I’ve been teaching about a year prior to that and could use all the advice I can get! I’ve never taught a grade level split before, so I wouldn’t be of much help. I’m also not able to conduct individual coaching sessions with teachers, simply due to time constraints. I’m sorry! Hie Angela Watson, l just want to really appreciate for what you are on. Thanks for your great advice! I was told I might be teaching a 1/2 split in the fall and I’ve never taught 1st, 2nd or a split before! What would your scope and sequence look like? Would you focus on primarily second grade curriculum or 1st? Thanks! Is there any way you can show me an example of a lesson plan for teaching two seperate history/ science/ spelling/ and penmanship for 4th and 5th grade? Hi I am Richie, handling Visually and Hearing impaired students, can ask some strategies or lesson planning than i could use… i think i have so much burden to take in making lesson plans and instructional materials. What is a Multi-level ESL Class? Multi-level classrooms are as varied as the students in them. Most often, they include students who communicate in English at a variety of different levels. They may also be considered multi-level because they include students with different types of learning backgrounds, such as those who have learned orally and those who have learned mainly from a textbook. Students may also have different levels of literacy in their own native language. A classroom that contains some students who are familiar with the Roman alphabet and some students who are not may also be considered multi-level. Finally, the term multi-level can be used to refer to a group of students working together who range greatly in age. When faced with the challenge of a multi-level classroom many teachers do not know where to start. They fear that the preparation will take much longer, and that the students will be more demanding. Schools that have multi-level classes often have limited budgets, and teachers may fear that they will not be paid for what they are worth. However, it is only by looking at the advantages of the multi-level classroom and employing strategies to overcome the challenges, that teachers can achieve success. One of the first things you should do when assigned to a multi-level classroom is determine the needs of the individual members. If possible, this should be done before the first class. You should also use this time to explain to your student that there will be other students with different levels of English in the class and that you will be using partnering and grouping exercises and activities in order to meet the needs of everyone. If you don’t have access to an office or classroom or you have a large class, you may want to e-mail the question to your students, or have short telephone conversations with them. When none of these options are possible, you can always set aside your first class as an intake day. If possible, stagger the start times of your students by five minutes so that you can speak to each one individually. Brainstorming in a group may also work if you have a small enough class. In a circle on the board place the words, “I need English to/for…” and ask students to volunteer their answers. Make sure to record the needs and level of each of your students in a simple way. Keep a chart for yourself, and alter it as your students’ needs change. Make a conscious effort to monitor the needs of your individual students regularly. You may find that some students feel uncomfortable acting as a peer tutor, while others feel that they are focusing too much on a skill that they will never use in the real world. Julio Mexico City Low-intermediate Will be working with tourists in his job as a golf instructor. Wants to learn conversational English. Doesn’t require writing skills. cross-ability learners: Pairs or groups of students working together with varying degrees of ability or competence. More advanced learners can gain confidence and improve competence by helping and teaching lower level peers. groupings: Different ways of putting students together (based on things such as cross-ability, like-ability, special needs, compatibility). like-ability learners: Pairs or groups of students working together who share similar levels of ability or competence. multi-level class: Group of students who learn and study together in one room, despite having varying levels of abilities and/or literacy backgrounds. self access materials: Learning resources (ex. listening exercises, readers) that include instructions and answers, and are available for a student to use independently. Students in multi-level classrooms often finish small group or individual assignments and activities at different times, so it is important to have self-access materials available at all times to keep students engaged in learning. small group activity: An exercise or game in which a small group of students can participate in and learn from. Groups can be composed in many different ways (common interest, common levels, varying levels) and changed often. whole group activity: An exercise or game in which all students can participate in and learn from, regardless of their competence level and language ability. Finding a core textbook for your class may help you if you have a number of students who are at a similar level of English. You may find that you need more than one level of the same textbook series. If you require more than two levels, however, using a core textbook may only make your life more complicated, and multi-level textbooks are difficult to come by. Another option is to use a theme based approach. Keeping all of your students working on activities and lessons based on the same theme is a great way of maintaining a class-like atmosphere in a multilevel classroom. Not only will this help your students feel like they all belong in the group, it will save you prep time and make you feel more organized. Follow up activities, such as games and discussions can then be based on the theme. English Club has collected a wide range of theme-based lessons to save time for teachers. Whole group Warm-up: Starting your class with a whole-group warm-up is a great way to foster a sense of community in your multi-level class. Information gap exercises: Works great for cross-ability and like-ability pairs. Crossword puzzles: Works well for cross-ability pairs or small groups. Despite their English vocabulary levels, each student will bring a wide variety of knowledge to the group to help fill in the puzzle. Self-Access Materials: Make sure everything is well labelled and organized. The materials should reflect the needs and interests of the students in your class. Self-Access materials can be intimidating for students if you just have a shelf full of textbooks. It is best to photocopy many copies of worksheets and exercises. If you have students who are preparing for something such as the TOEIC test, have a file marked TOEIC Practice sheets. If your students need to improve their listening skills, have an audio shelf with an easy-to-use CD/tape player and level appropriate resources (CD’s and worksheets). Rather than having guided readers, it is better to have photocopies of stories or articles with corresponding tasks (such as writing activities) stapled right to the readings. 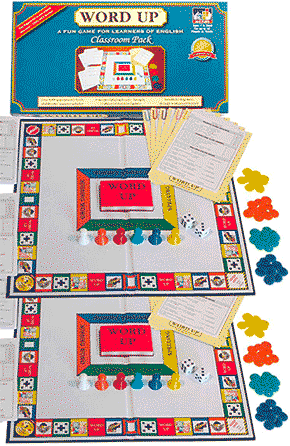 Board games, such as Word Up (comes with question cards for 5 different levels), should be viewed as an essential tool in every multi-level classroom. Folktales: It is easy to find different levels of common folk or fairytales. These work well in children’s classes, and there are even some that are appropriate for adults. If you have difficulty finding a folktale that is a suitable level, you can always rewrite one yourself and use it again and again when you teach. A local children’s librarian should be able to direct you to resources that you need. The follow up activities for folktales are unlimited, but include comprehension questions, group discussions, vocabulary activities, creative writing exercise, and role-playing, all of which can be done in various groupings. Art and images: Visual stimuli can be a great teaching tool. Use paintings as the basis for class discussions, writing assignments, and vocabulary building. Students of all different levels can participate together by describing photographs. Encourage students to bring in their own pictures and art and find ways to build lessons around them. One great pair activity that acts as a listening and speaking activity is to put students in pairs and have one of them describe a picture while the other tries to draw it. This can also be done as a whole group. Your students can choose a photo and describe it to you or another student who will try to reproduce it on the board. Computer lab assignments: If your school has a computer lab for students to use, or if you have a computer in your classroom, allow pairs to do online English lessons with EnglishClub’s Learning Centre . Jot down the URL’s of any lessons you think will be useful, or give your students free time to explore the site. Experiment with different types of groupings to find the ones that work best. You may find that cross-ability pairs work best for certain types of activities, while like-ability small groups work better for others. If possible, use a wide variety of groupings to keep things interesting for your class. Use a simple schedule that is similar each day. Start with a warm-up that involves the whole group. Break part of the class off into one type of grouping (i.e. pairs) and work with part of the class on a lesson, grammar point, or activity. Break off the class into another type of grouping (i.e. small groups) and have the other students use self-access materials. Bring the class back together for a whole group activity/game. Isolate students within the class who are interested in peer tutoring. This doesn’t have to be the student with the highest level of English. Your students who fall somewhere in the middle may in fact be the most valuable to you, as they strive to attain a level of competency comparable to the most advanced students. Remind your students that the best way to practice and improve a new language is to teach it to someone else. Limited budgets or low enrolment are often the reasons behind multi-level classes. For this reason, it may be difficult to convince administrators or managers that you need a paid assistant. If you feel overwhelmed, consider hiring a volunteer. Finding someone who is interested in helping you with your preparation work and teaching may not be as difficult as you think. Most native English students who are going into the teaching profession will be more than willing to put in volunteer teaching hours in exchange for a reference. Once you have permission from your supervisor, you can post an ad at the local library or college, or at a teacher training centre. You may even want to suggest placing an ad on the website for the school you work at. EnglishClub is a great place to start when looking for activities and exercises that will reduce your preparation time. The Teacher’s Guide is filled with ideas and links to help save you time while planning interesting, fun, and worthwhile activities and lessons for your students. You will find many worksheets that can be used as self-access materials, and numerous activities that can be used when your multi-level group is learning together. Teach English with idioms! 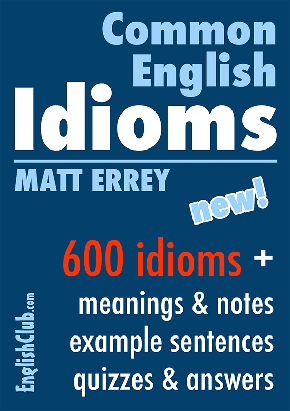 Over six hundred idioms with clear definitions, example sentences and fun quiz questions, with answers. Download Common English Idioms and help your students understand! WORD UP Quiz Game: Special Classroom Pack for teachers. An easy-to-play, fun and exciting quiz game for learners of English. Each set contains thousands of questions graded into 5 levels (beginner to advanced) with all the answers included. For all ages.